Unfortunately, there are some times that we are unavailable to give you a guided tour of our campus (after hours, weekends, holidays, etc.). Therefore we created the next best thing, our Self-Guided Tour Packet (PDF). Print the Tour Packet (PDF) or download it to your mobile device. 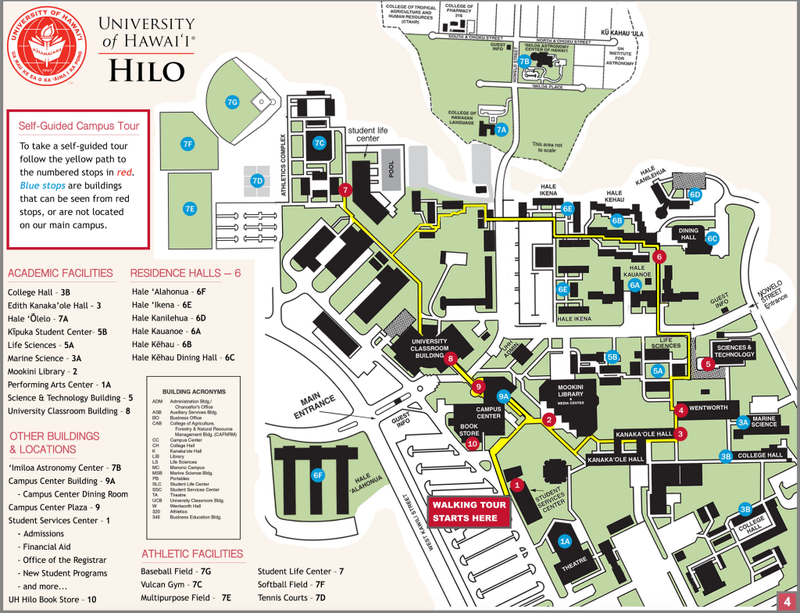 Come to the UH Hilo Campus. Follow the yellow path on the map on page 4 of your packet. The numbered red dots indicate stopping points along the way and the blue dots are points of interest. We included an enlarged map of the Residence Halls on page 3 along with some detailed information our housing options. If you have questions or want to meet with an admissions staff, please reach out to our Admissions Office. We are happy to speak with you!